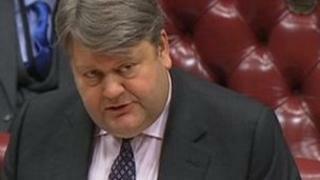 Lord Strathclyde has resigned from his cabinet role as Leader of the Lords. The BBC's James Landale says he is going voluntarily at the age of 52, while he still has time to pursue a second career in business. His departure, which was discussed with David Cameron over the festive break, came as a surprise after 25 years on the front bench for the Conservatives. He will be replaced by Lord Hill of Oareford, a former John Major aide, who entered the Lords in 2010. Prime Minister David Cameron praised Lord Strathclyde's contribution, describing him as a "brilliant public servant". Speaking at the launch of the coalition government's mid-term review, Mr Cameron said he was "sad to see him go" as he "knew the House of Lords inside out" and had done a great job on behalf of both the government and his party. The then Prime Minister Margaret Thatcher gave Lord Strathclyde his first job as a whip in the 1980s and he has been on the front bench in the Lords ever since. He has served six party leaders, including three prime ministers. The BBC's James Landale says his friends insist there is absolutely no political reason for his departure. It is just, they say, that he feels he has done his time. The peer has been the Tory leader in the Lords for 14 years since his predecessor Lord Cranborne was sacked by William Hague in 1998 for "running in like an ill-trained spaniel" and negotiating secretly with Tony Blair over Lords' reform. Behind a jovial demeanour, he is one of the cabinet's shrewdest political operators. He was also a minister of state at the Department of Trade and Industry during the 1990s and his various junior ministerial jobs covered tourism, Scotland, the environment, and consumer affairs. In his resignation letter to Mr Cameron, Lord Strathclyde says: "When I was invited to join the government by Margaret Thatcher in 1988, I never believed it was a career for life. I didn't expect it would consume me for as long as it has or that I would one day lead the Lords and sit in a cabinet. "The Lords is an extraordinary and vigorous place, but recently I've been considering a change of direction. "I started my working life in the private sector and at some stage always hoped to return, I would now like to do so... I do not see a political career as the cap of everything and would like, while there is still time, to take up other threads of my life and other interests." He added: "I always promised myself that when I did leave I would do so when I could make a smooth handover to a strong successor. Whatever my feelings on the matter, reform of the Lords is effectively over and now is a good time to manage that handover." In his letter of reply, the PM said that "after a quarter of a century on the front bench I entirely understand your desire to pursue other interests". He added: "You have been an outstanding Leader of the Lords. Under your leadership the Lords has enhanced its role as our second legislative chamber. Your assured handling of business of the House and your understanding of its traditions and practices have earned you the deep respect of Peers across the House. "You have ensured the House has continued to play its unique role in the governance of the United Kingdom with great distinction." Lord Strathclyde will be replaced by education minister Lord Hill of Oareford, who was most recently in the news after Mr Cameron apparently missed his attempt to resign during a meeting in the most recent cabinet reshuffle. Lord Hill - the same age as his predecessor - faces a difficult job in which he will have to guide legislation through an Upper House where tensions have been on the rise. The coalition has suffered more than 50 defeats since 2010 in the Lords and Lord Strathclyde raised eyebrows in July when he accused veteran Labour peer Lord Barnett of "gross discourtesy". There were also disputes in the Lords before Christmas over his handling of a change in business which avoided a vote in the Lords on plans to change parliamentary boundaries - a vote which the Conservatives were thought likely to lose. Lord Hill, who was political secretary to John Major in the 1990s and a special adviser to Ken Clarke in the 1980s, was made a peer and became an education minister after the coalition came to power in May 2010.